...a man estimable for his learning, amiable for his life, and venerable for his piety. Arbuthnot was a man of great comprehension, skilful in his profession, versed in the sciences, acquainted with ancient literature, and able to animate his mass of knowledge by a bright and active imagination; a scholar with great brilliance of wit; a wit who, in the crowd of life, retained and discovered a noble ardour of religious zeal. The Lives of the English Poets (1826), vol. 2, 257. A huge net is being dragged across the sea floor, destroying everything in its path. Ahead of it bloom undersea forests and their hundreds and thousands of living creatures, both plant and animal; behind it is a desert. 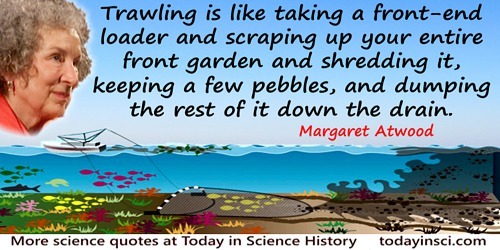 The net is pulled to the surface and most of the dead and dying life forms in it are thrown out. A few marketable species are retained. [Trawling] is like taking a front-end loader and scraping up your entire front garden and shredding it, keeping a few pebbles, and dumping the rest of it down the drain. In Payback: Debt and the Shadow Side of Wealth (2008), 191. An old writer says that there are four sorts of readers: “Sponges which attract all without distinguishing; Howre-glasses which receive and powre out as fast; Bagges which only retain the dregges of the spices and let the wine escape, and Sives which retaine the best onely.” A man wastes a great many years before he reaches the ‘sive’ stage. Governments and parliaments must find that astronomy is one of the sciences which cost most dear: the least instrument costs hundreds of thousands of dollars, the least observatory costs millions; each eclipse carries with it supplementary appropriations. And all that for stars which are so far away, which are complete strangers to our electoral contests, and in all probability will never take any part in them. It must be that our politicians have retained a remnant of idealism, a vague instinct for what is grand; truly, I think they have been calumniated; they should be encouraged and shown that this instinct does not deceive them, that they are not dupes of that idealism. In Henri Poincaré and George Bruce Halsted (trans. ), The Value of Science: Essential Writings of Henri Poincare (1907), 84. If this fire determined by the sun, be received on the blackest known bodies, its heat will be long retain'd therein; and hence such bodies are the soonest and the strongest heated by the flame fire, as also the quickest dried, after having been moisten'd with water; and it may be added, that they also burn by much the readiest: all which points are confirm'd by daily observations. Let a piece of cloth be hung in the air, open to the sun, one part of it dyed black, another part of a white colour, others of scarlet, and diverse other colours; the black part will always be found to heat the most, and the quickest of all; and the others will each be found to heat more slowly, by how much they reflect the rays more strongly to the eye; thus the white will warm the slowest of them all, and next to that the red, and so of the rest in proportion, as their colour is brighter or weaker. A New Method of Chemistry, 2nd edition (1741), 262. 'Uber die Pathologische Bedeutung der Intracellularen Verduung', Fortschritte der Medizin (1884), 17, 558-569. Trans. Alfred I. Tauber and Leon Chernyak, Metchnikoff and the Origins of Immunology (1991), 141. Sections and Views Illustrative of Geological Phenomena (1830), viii. Modesty. Never think you know all. Though others may flatter you, retain the courage to say, “I am ignorant”. Mad Love (1937) translated by Mary Ann Caws (1988), 25. Now if Light be reflected, not by impinging on the solid parts of Bodies, but by some other principle; it's probable that as many of its Rays as impinge on the solid parts of Bodies are not reflected but stifled and lost in the Bodies. For otherwise we must allow two sorts of Reflexions. Should all the Rays be reflected which impinge on the internal parts of clear Water or Crystal, those Substances would rather have a cloudy Colour than a clear Transparency. To make Bodies look black, it's necessary that many Rays be stopp'd, retained, and lost in them; and it seems not probable that any Rays can be stopp'd and stifled in them which do not impinge on their parts. Opticks (1704), Book 2, Part 3, Prop. VIII, 69. Zoonomia, Or, The Laws of Organic Life, in three parts (1803), Vol. 1, 395. The Life of Reason, or the Phases of Human Progress (1954), 82. Scientists have one thing in common with children: curiosity. To be a good scientist you must have kept this trait of childhood, and perhaps it is not easy to retain just one trait. 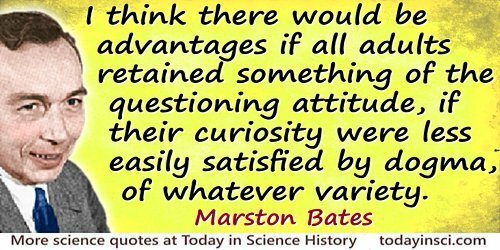 A scientist has to be curious like a child; perhaps one can understand that there are other childish features he hasn't grown out of. What Little I Remember (1979), 86. The Big Idea that had been developed in the seventeenth century ... is now known as the scientific method. It says that the way to proceed when investigating how the world works is to first carry out experiments and/or make observations of the natural world. Then, develop hypotheses to explain these observations, and (crucially) use the hypothesis to make predictions about the future outcome of future experiments and/or observations. After comparing the results of those new observations with the predictions of the hypotheses, discard those hypotheses which make false predictions, and retain (at least, for the time being) any hypothesis that makes accurate predictions, elevating it to the status of a theory. 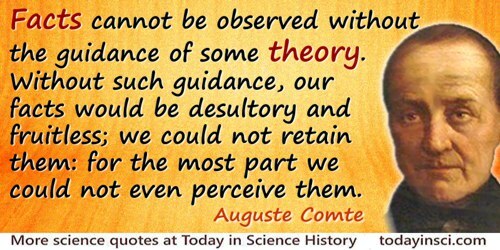 Note that a theory can never be proved right. The best that can be said is that it has passed all the tests applied so far. In The Fellowship: the Story of a Revolution (2005), 275. 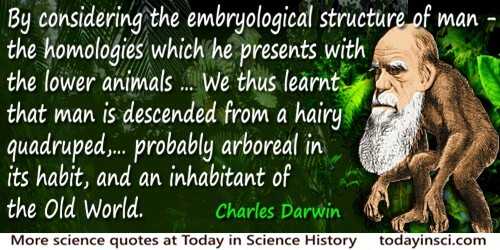 As translated and quoted in Ernst Haeckel and E. Ray Lankester (trans.) as epigraph for Chap. 13, The History of Creation (1886), Vol. 1, 406. The Crack-Up (1936, 1993), 69. There could not be a language more universal and more simple, more exempt from errors and obscurities, that is to say, more worthy of expressing the invariable relations of natural objects. Considered from this point of view, it is coextensive with nature itself; it defines all the sensible relations, measures the times, the spaces, the forces, the temperatures; this difficult science is formed slowly, but it retains all the principles it has once acquired. It grows and becomes more certain without limit in the midst of so many errors of the human mind. From Théorie Analytique de la Chaleur, Discours Préliminaire (Theory of Heat, Introduction), quoted as translated in F.R. Moulton, 'The Influence of Astronomy on Mathematics', Science (10 Mar 1911), N.S. Vol. 33, No. 845, 359. This science [experimental science] alone, therefore, knows how to test perfectly what can be done by nature, what by the effort of art, what by trickery, what the incantations, conjurations, invocations, deprecations, sacrifices that belong to magic mean and dream of, and what is in them, so that all falsity may be removed and the truth alone of art and nature may be retained. This science alone teaches us how to view the mad acts of magicians, that they may be not ratified but shunned, just as logic considers sophistical reasoning. To have heard without retaining does not make knowledge. In 'Paradise', The Divine Comedy of Dante Alighieri (1308-1320), translated by Charles Eliot Norton (1902), Vol. 3, Canto 5, line 41-2, 36. When you know a thing, to hold that you know it; and when you do not know a thing, to allow that you do not know it;—this is knowledge. Words were originally magic, and the word retains much of its old magical power even to-day, With words one man can make another blessed, or drive him to despair;… Words call forth effects and are the universal means of influencing human beings. Therefore let us not underestimate the use of words in psychotherapy. From a series of 28 lectures for laymen, Part One, 'The Psychology of Errors'. Lecture 1, 'Introduction' collected in Sigmund Freud and G. Stanley Hall (trans. ), A General Introduction to Psychoanalysis (1920), 3.